What Is A Burning Barrel? Think GREEN please and do our planet a good deed. Always RECYCLE all of your waste that you possibly can. Compost your organic waste, separate your plastic, your tin cans, your newspaper and cardboard, take your electronics to the depot - make the effort to do all that you possibly can. After you have made your contribution to mother earth you will likely be left with Non-Recyclable waste - this is the waste that is difficult to dispose of and you could send it to the local landfill or it could be burned. 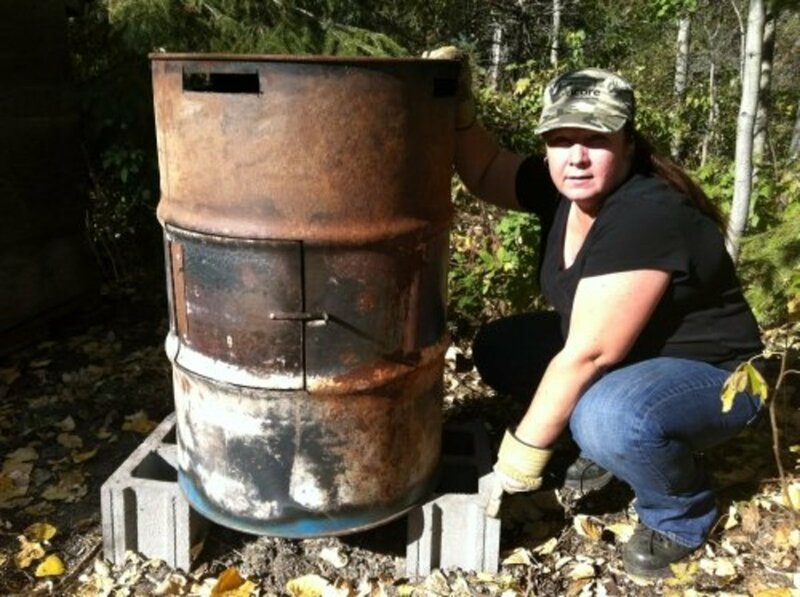 If you live on a property where burning is permitted, you could easily build your own efficient non-recyclable waste incinerator or burning barrel economically from recycled materials. A burning is simply a steel drum with a few minor modifications to allow the safe containment of garbage during the burning process. 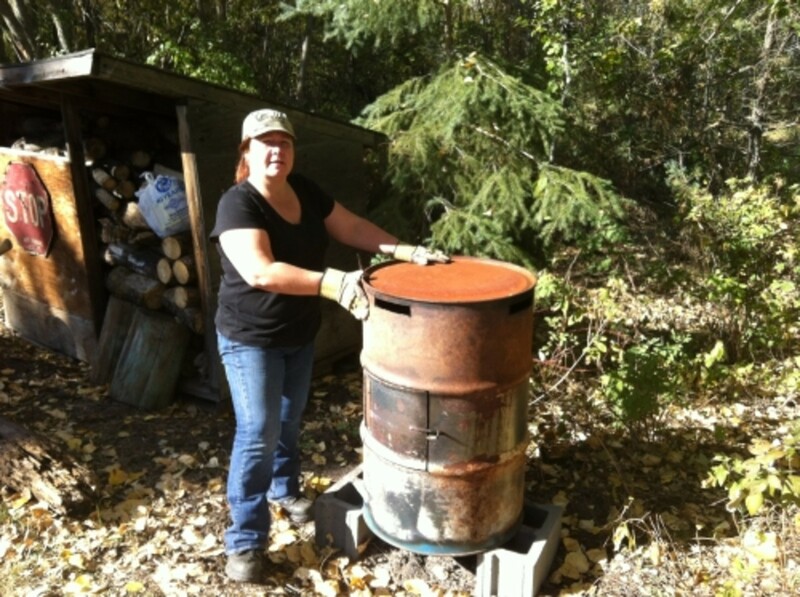 Though a simplistic structure the design is important if you want your burn barrel to incinerate your waste with maximum efficiency, Learn how to build your own waste incinerator here. A safe containing and efficient burning barrel. Keep the garbage inside the burning barrel and the snow or rain outside. First thing you will want to do is get yourself a good steel drum. These are quite easy to find. 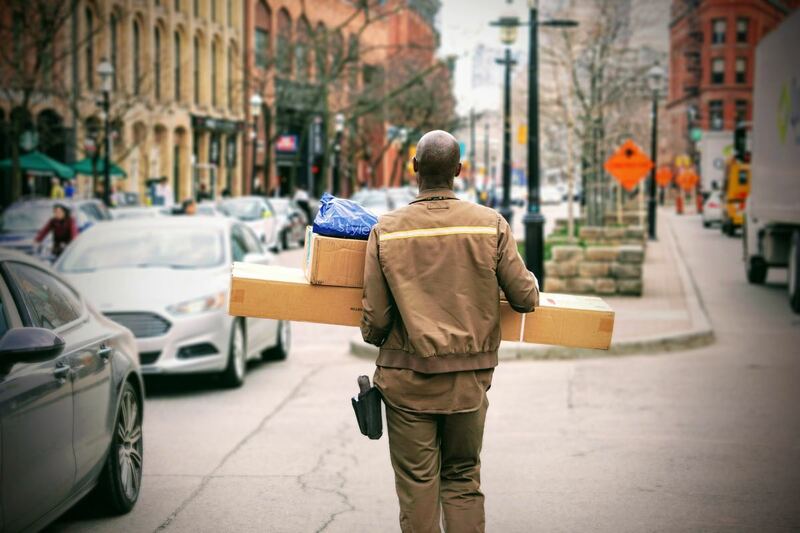 Many industrial corporations give them away free and advertise them in the FREE section of the local classifieds. Help them out by recycling one of their barrels. Once you have your barrel you will also need some type of heavy metal mesh or screen large enough to cover the circumference of your steel drum. This material is available FREE also from many large metal fabricating companies who throw "cutoffs" [smaller pieces of new material left over from the use of the full sheet] in their recycle steel bin. Just ask for a small piece and they will likely give it to you. The hinge you will need for the door of your burn barrel can be salvaged from many places. its style is not important as long as it is not too large or too small. Perhaps ask around your neighborhood for an old door hinge. Some one you know will likely have a hinge that they will give you. For the handle or the door just use your imagination - many non-combustible items will work. Lastly on the material list your project will require 5 or 6 small bolts. 1/4 inch bolts 1 inch long would be ideal but slightly smaller or larger or shorter or longer is not that important you can make them work. The tools for this job are an angle grinder with a thin abrasive cutting disc and a drill with a drill bit the diameter of your bolts. You will need a ruler for measuring and marking straight lines, a marking pen, a screwdriver and a wrench to tighten the bolts as well. With the grinder cut the bottom , the exhaust ventilation ports, and the door out of the barrel to make your efficient operating incinerator. Cut the top end out of the barrel making the bottom. Leave 1 inch of material inside the rim for a lip to set the mesh on. Cut 4 1 inch X 6 inch slots in the side of the barrel every 90 degrees near the top rim for exhaust vents. After gathering all your materials and tools you can begin your build. Begin making the bottom of the incinerator out of the top end of the barrel. Cutting out the top end of the drum gets rid of the barrel bungs or plugs which are of no use to your completed incinerator. Turn your barrel topside up letting it sit firmly on its bottom end. With the measuring device and pen mark at 1 inch segments inside the barrel rim 1 inch outward towards the center of the barrel end. Once you have marks every inch all the way around the rim join the marks together by free hand drawing - like connect the dot pictures in a coloring book. Now that you have a complete 360 degree circle marked 1 inch in from the barrel rim you can get your grinder with the cutting disc and begin to cut. Be sure to ware a face shield and some safety glasses and your gloves. A grinder can cause serious injury to your body if you are not properly protected. It is not only the sparks you have to worry about when grind. The disc could explode sending high speed shrapnel towards your body and face impelling you with shards of abrasive disc. Thin cutting discs are notorious for exploding so be extremely cautious. With your grinder held firmly in both hands and the cord end perpendicular to the metal lightly press the tip of the cutting wheel down on the circular line that you marked earlier. Allow only the very tip of the cutting disc to Pierce the steel and then raise up your grinder and repeat the procedure beside the last cut. Follow the line making your way completely around the 360 degrees of the line that is drawn on the metal. When you have completed the cut the barrel end should fall free. On the lip that is left inside the rim is where you will set the metal mesh after preparing it. Remove the metal circle piece that you just cut out of the barrel end and then we are ready to start the exhaust vents. Turn the drum over setting it firmly on its newly cut end. Now with the enclosed end up take your marking pen and make a line on the edge of the rim every 90 degrees. Do this by laying a straight edge across the barrel end through its center. Make a mark on both side of the rim where the straight edge lies and then rotate your straight edge 90 degrees and mark again. You should have 4 marks evenly spaced around the barrel marking the center location of each exhaust port cutout. Now transfer your 4 lines from the rim down onto the drum side about 3 inches. Using this line as a center reference mark and beginning 1 inch below the rim take your ruler and mark out a 6 inch by 1 inch rectangle in all 4 locations. After you finish marking lay the drum over onto its side and secure it so that it can not roll. To do this just put a block of wood or a larger stone underneath the barrel on both sides. Once the barrel is positioned with one rectangle marking on top use the grinder following the earlier described operating technique and cut out the marked rectangle. Rotate the drum and repeat the procedure for all 4 marked rectangles. You now have your exhaust vents. All that is needed to complete our incinerator is a screen and a door. For the door installation you will want to stay between the two reinforcing ribs that encircle the drum. Cutting out these ribs will only weaken the barrel and metal becomes much weaker when it is heated. Leaving these rib intact will keep the incinerator from warping when the interior temperature reaches extreme heat zones. I suggest that you orient your door's location slightly different than I have. I have an exhaust vent directly above my incinerator door and I discovered that if I wish to access the barrel while refuse is ignited heat and flame below out of the port in close proximity to my face. This hazard could cause severe burns to one's face if caution is not exorcised. Perhaps put the door centered between two exhaust ports to alleviate this problem. Cut the door out of the center of the drum between the two ribs. If you have two smaller pieces of screen you can use them by putting a center support under the two half circles of mesh. With your ruler and pen mark a 12 inch long horizontal line just below the center of the upper barrel rib and a parallel line just above the center of the lower barrel rib. Now join the ends of both parallel lines with a vertical line making a square and then cut with your grinder along the 4 lines. Be careful to cut this section neatly because you will be using the cutout for the door and neatness will produce a more aesthetically pleasing finished product. After you have the door cut out take your hinge that you salvaged from somewhere and set it on the vertical side of the door cutout. With the center pin of the hinge centered on the very edge of the door and in the middle of the door mark the hinge bolt holes with a pen. Now take your drill with the correct diameter drill bit and drill the holes that you marked and then bolt the hinge to your door. The next step you may need help to hold the door centered in its opening on the drum. When the door is positioned correctly in the opening where it was removed from mark the holes of the opposite side of the hinge. Then drill the holes and install the bolts. Now the door is hung. The handle of the door can be made form almost anything non-combustible. You could use a larger bolt, or cut a piece of metal with your grinder off of the barrel end that you removed earlier. Whatever you decide to use just drill another hole or two and bolt it on to the door in a convenient location and then your door will be complete. Does Your Household Produce Non Recyclable but Burnable Waste? 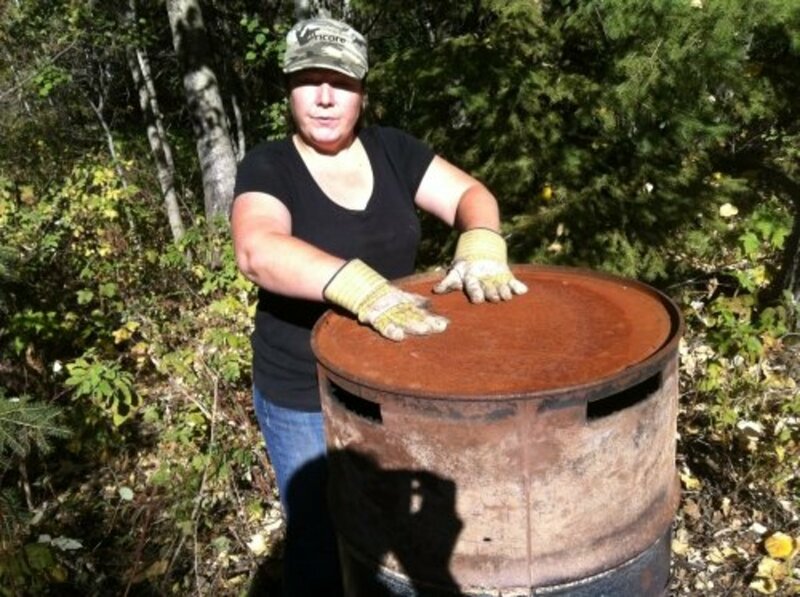 The mesh or screen for the incinerator floor can be marked out by setting it on the drum and drawing a line on the mesh following the inside circumference of the barrel rim. Once you have your mark use your grinder again to cut the screen. If you do not have a large enough section of screen to cover the complete floor, you can do as I have done with the mesh in the floor of my incinerator. I put a piece of metal across the opening of the floor and then put two smaller screens in the incinerator resting on the barrel lip and the metal strip. 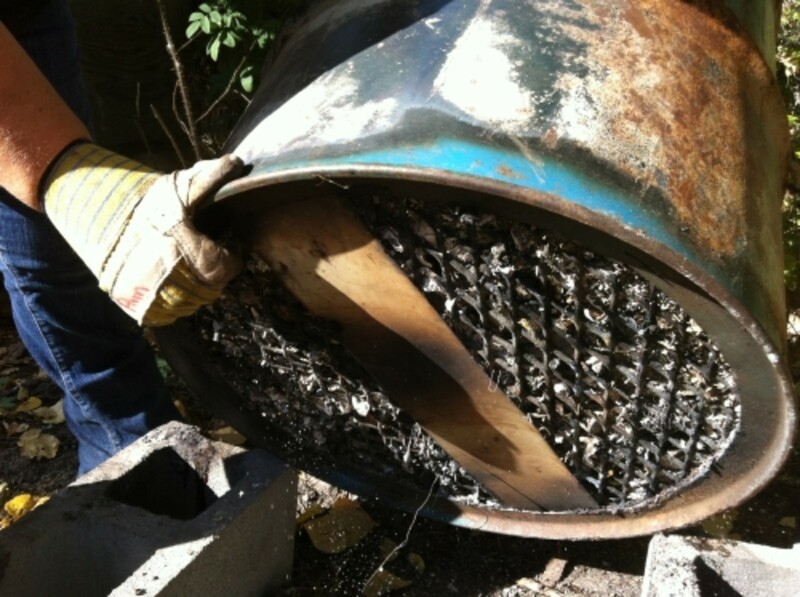 Be sure your screen and supporting metal strip, if you choose to use one, are heavy enough to carry the weight of the refuse that you will be putting in the burning barrel. If your screen is in one piece you will likely have to bent it slightly to get it into the incinerator through the lip that it will rest on. 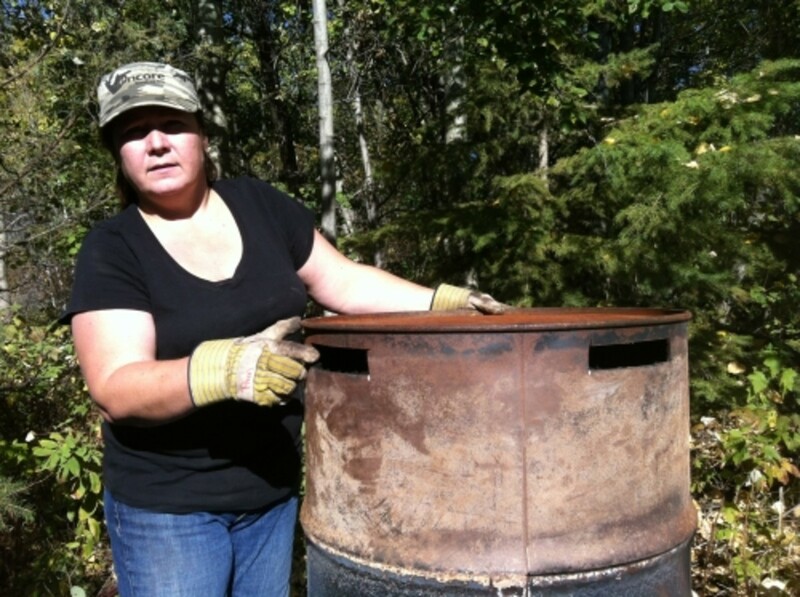 Install the mesh and you are finished building your own non-recyclable waste incinerator. Set some non-combustible blocks under your incinerator. You could use steel or ceramic or brick as long as it can not ignite. 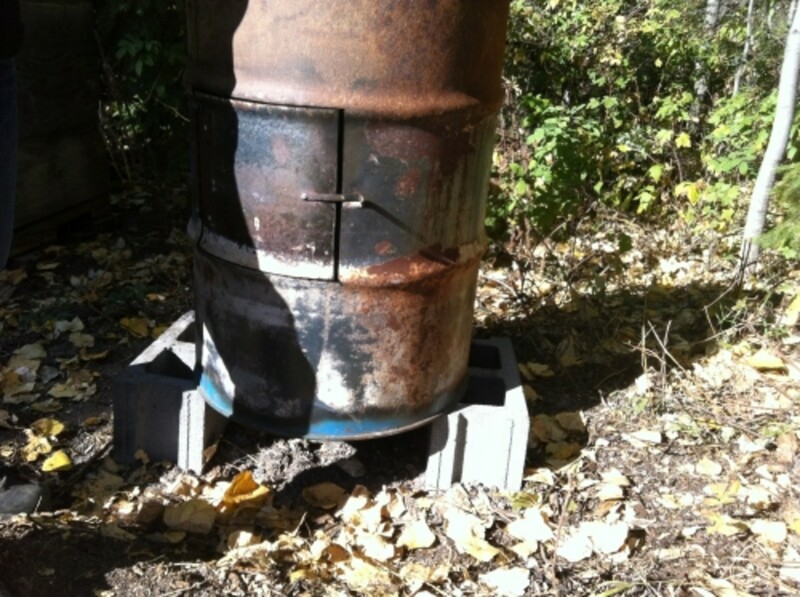 Find a suitable location for your incinerator and set it up on some non-combustible blocks. It is very important that the incinerator sits up on blocks to allow an unrestricted supply of oxygen into the fire through the bottom mesh. This free flow of oxygen feeding the fire keep the fire burning rapidly. The small exhaust ports at the top are designed to retain the heat inside the incinerator allowing only a small amount to escape slowly. Because of the extreme internal heat created inside the incinerator your refuse is almost completely burned up and and the exhaust emitted is almost colorless while the fire is burning. If you are considering building yourself a garbage burning barrel this design get my approval for both economy and efficiency. This burning barrel style feeds the fire oxygen rapidly through the full bottom floor screen and contains most of the heat inside by the enclosed top. This design allows for extremely high internal temperatures which incinerates refuse cleanly. I welcome all your questions and comments as well as any suggestions or ideas of your own. Please contact me through any of my links with any input that you desire to contribute. I enjoy hearing from everyone. You can make aligning the door simpler but attaching the hinge(s) after making the first vertical cut. The make the remaining cuts. The door will be centered and you won't need three hands to hold everything together and juggle tools, etc. Now you know my secret - my husband is a welder. Skilled welders seem to be very innovative with powerful mechanical aptitudes. I love to learn and I do get involved up to my elbows, but I have an adept instructor. Thank you for visiting. I stand in awe of your how to skills. My Dad was a welder and used to work with these kinds of barrels making barbecue pits on the weekends. It was hard, hot, loud work, not the he complained. It's just what I observed. We moved to BFE so this is highly useful information. I don't know that I could do this honestly, being not so used to the power tools but my hubby could and me thinks it's a great project for me to learn on by doing it with him. Thank you for practical information! Very informative..very helpful. I am going to use this in a rural area in the Philippines. Thank you very much. I have chosen this lifestyle after spending 30 years in the hectic ratrace of the six figure income earners. This is serenity for me. 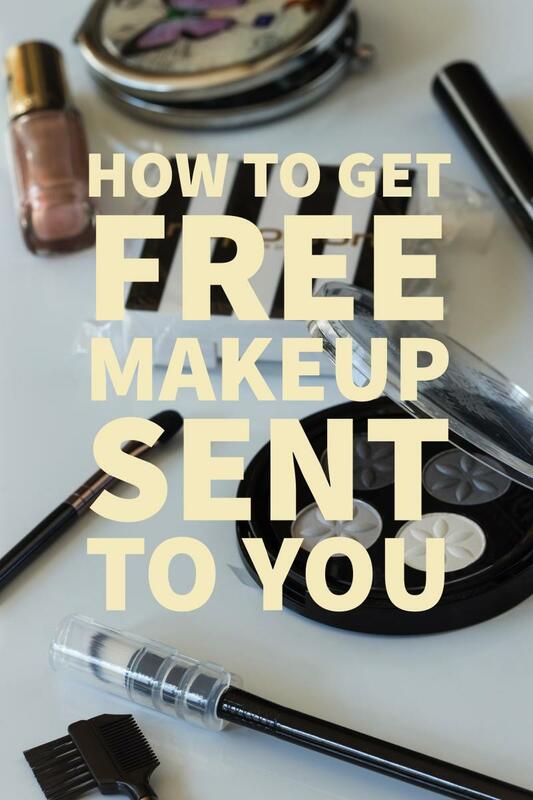 This is excellent information, because there may come a time when we need to know how to do this. I'm looking for something for the villages of India where they smolder small plastic fires twice a day.